The existence of the Sannai-Maruyama site was known during the 17th century in the Edo Era, but the revelation of it being Japan’s largest Jomon settlement came to light after long years of excavation. The settlement existed between 2000 and 3500 BC, and it’s considered to have been around at the same time as Stonehenge in England and the Pyramid of King Cheops of Egypt. From these ruins, structures such as pit houses, raised-floor houses and pillared buildings have been revealed, and from the large number of artifacts, the sedentary lifestyle of the Jomon people who lived on this site rich in nature from the mountains and seas and the distant trade and commerce has been illustrated so that in the year 2000, the site was registered as a National Special Historic Site. The site is generally free to the public, and at the San-Maru Museum, there are a total of 1700 exhibits on display including 500 Important Cultural Properties that have been unearthed. Among these are artifacts which relate the high skill possessed by the Jomon people such as woven Jomon pochettes and wooden plates painted in red lacquer. Also, there are dioramas which recreate the life of those times, commentary from digital photo frames, and videos, plus there are interactive workshops where you can make items such as Jomon pochettes and amber pendants through the techniques used by the Jomon people. 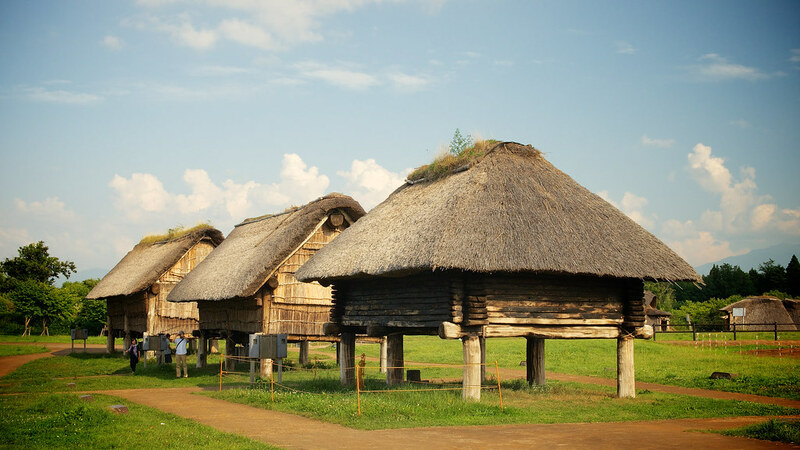 Outside, restored Jomon houses from that time are displayed which can be toured. At the Sannai-Maruyama Ruins, many services are provided for visitors. In the museum, Jomon clothing can be rented so that you can enjoy taking that commemorative photo. As well, the multi-language service doesn’t involve only pamphlets but video translation unit rental, English explanation of the exhibits, and other services for foreigners. Other amenities include rental of baby carriages and wheelchairs, and restaurants so that children and adults alike can spend a worry-free time on the site. Oirase Stream which flows between Nenokuchi on the shores of Lake Towada and Yakeyama is a stream which has one of Japan’s loveliest views. On the 14-kilometer stream, there are clear streams and waterfalls along bold cliffs created by nature whose appearance is filled with change. 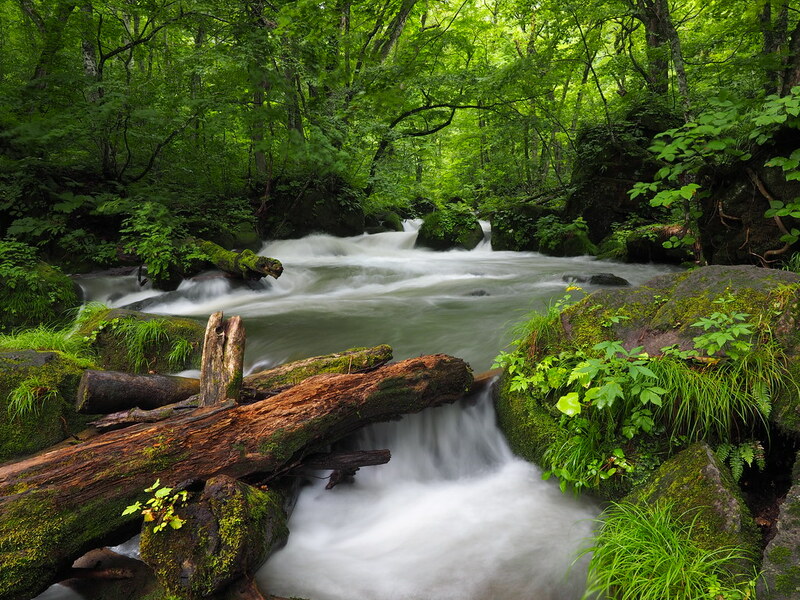 This area is within Towada-Hachimantai National Park, and it has been recognized nationally as a Special Place of Scenic Beauty and preserved as a Natural Monument. It not only has wild birds and fish living in the stream, but unique animals such as wild goats and the Tohoku salamander also inhabit the area. It is a green paradise which charms visitors with its mystique certainly evoking a deep remote area in Tohoku. The stream is surrounded by natural woods distinct to Japan where you can enjoy a mossy scenery built from waterfalls and rocks brimming with character. The area is a dynamic sight to see with 3 bodies of water flowing together: the rough-flowing Samidare-no-Nagare, the Ashura-no-Nagare which crashes into the rocks, and the Choshi Ohtaki Waterfall which, at a width of 20 meters, is the largest waterfall at Oirase Stream. Also, with the new leaves glinting in the spring, the sky being covered by the many trees during the cool summer, the vivid colors of the fall and the snow and icicles of the harsh winter, the seasonal vistas formed from the nature in the Tohoku region will always charm you with a special atmosphere no matter when you visit. Oirase Stream, which splendidly preserves the lush natural environment, has a road and walking path running alongside it which are easy to traverse for the average tourist. The walking course from Ishigedo to Lake Towada is popular for its beautiful landscape, but since there is not one washroom along the 14-kilometer course, please plan your breaks accordingly. Also during the snowy winters, the temperatures drop severely so it is advised to wear appropriate shoes and clothing for the nature walk. One of Japan’s Three Sacred Grounds, Mt. Osore has been worshiped by people since ancient times. Bodai-ji Temple was founded in the year 862 by the priest Jikaku Daishi Ennin as a place to study Tendai Sect asceticism. Later in 1457, the temple was abandoned but was successfully restored in 1530, and the temple’s principal image, Enmei Jizo Bosatsu, was worshiped as “The Buddha to save people from various sufferings”. Also known as a place for memorial services for the dead, during the Itako Taisai Festival, spiritual mediums known as “itako” perform the widely-known kuchiyose ritual of delivering messages from the dead. Mt. Osore, which has been described by the local people through quotations such as “If a person dies, he goes to Mt. Osore” and “As you stay in this world, this is the place where you will approach the other world”, intrigues many people with its distinct mystique at the northernmost point of Honshu and its desolate atmosphere. After passing places such as the striking vermilion arched bridge that spans the Sanzu River which is the supposed boundary between the living and spirit worlds, the desolate and rocky Hell of the Blood Pond, the Endless Hell and every possible hell, if you go beyond the landscape of many piles of rocks known as the Children’s Limbo, you will finally reach the blue Lake Usori with its beautiful white sand dunes. That sight is Paradise itself. It is certainly a mysterious landscape. At the sacred ground of Mt. Osore, there are many types of hot springs bubbling away. The four bath huts are generally open to the public and can be used for free. There are accommodations operated by temples known as temple guesthouses, and these places are recommended to get that mysterious experience only felt on Mt. Osore. It is at these temple guesthouses that you can try Buddhist vegetarian cuisine and experience prayers with the priests. The rules are a bit strict but it is a special Japanese experience. Shirakami-Sanchi, a mountainous area 1000 meters in altitude which spans from southwestern Aomori Prefecture to northwestern Akita Prefecture, was registered in 1993 as a UNESCO World Natural Heritage site for its valuable region of primeval Japanese beech forest which has covered northern Japan’s hills and mountains from 8000 to 12000 years ago. As has been explained as a reason for its registration (“The world-class scale and distribution of a virgin natural Japanese beech forest that has been barely touched by Man”), Mother Nature there has been left untouched and the area has been an example of a natural museum with many precious flora and fauna inhabiting the sanctuary continuing to be hospitably protected. The entirety of the wide area is a natural treasure box with a precious heritage, so to know its true colors, you have to officially apply to enter the area to test your climbing prowess and to enter the core region. However, a trekking course for average tourists is available whose charms can be fully enjoyed. A regular traveler can trek without needing permission along areas such as Anmon-no-Taki consisting of 3 waterfalls, Juni Lake which was formed from a group of 33 large and small lakes, and Shirakami-dake which has a mountain-climbing path. You can get a full appreciation of Mother Nature through the primeval Japanese beech forest, the mysterious azure wetlands and the dynamic waterfalls born from the difference in elevation of the deep valley. At the Shirakami-Sanchi Visitor Center, models and large-screen videos explaining the area’s nature and ecosystem introduce its attractiveness. There are also pamphlets in English for foreign visitors, and information can be collected on matters such as the trekking course. In the interests of safety, it is recommended to wear the appropriate clothing and shoes for trekking for regular travelers going into the allowed zones. Please be aware that the region is closed during winter between late November and late April. If you are interested to know more and save your time during your trip to Aomori, You can send a message to our local guides to get a customized itinerary and quotation for an unforgettable experience.